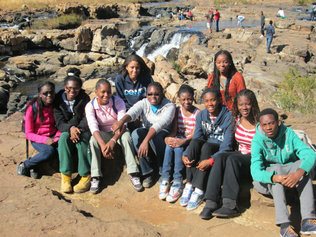 Ten students from Doctors Charter School visited South Africa this summer. Kayla Joseph, 11, had never left Florida until this summer. Having never had even been on a plane, the North Miami rising seventh-grader prepared for a long flight to South Africa on June 22. Joseph was the youngest of 10 students, ranging from sixth- through 12th-graders from Doctor Charter School in Miami Shores who embarked on an educational trip to South Africa planned by social studies teacher, Kayla Dorsey. Dorsey said she planned the trip to offer students a more comprehensive education on culture, geography, environment and social justice, which were the learning themes of the trip. Parents paid most of the cost of the trip, about $4,500 per student, but students also held car washes and garage sales to help. They received no financial help from the school. During the trip, students visited various parts of Johannesburg, Cape Town and Ruben Island, where they saw Nelson Mandela’s former prison cell. While the students were there, they were asked to write journal entries about their experiences. “While setting foot into the empty cells of past prisoners I realized that I did not have it bad at all,” read 17-year-old Makana Levy’s journal. “I took a deep breath, reading the letters that an imprisoned husband sent to his wife, and I tried to understand how that felt. I realized how blessed I was, walking through the prison on vacation-not on a sentence,” the rising senior from North Miami wrote. For Nicole Stallworth, 14, learning about the race struggles in South Africa is what resonated with her about the experience. Stallworth said she signed up for the trip just to get the chance to travel. Ashley Vilsaint, 16, said her favorite part of the trip was the safari and the chance to see wild animals up close, particularly the baby elephants. But, her view of the country changed once she arrived. Shellee Baker, 14, remembers it a little differently than Vilsaint. Dorsey said what the students learned on the trip cannot be taught in a classroom.